WASHINGTON --- The Association of the United States Army (AUSA) opened its annual meeting in Washington, DC, on October 8. The three-day exposition brings together a host of U.S. and international military personnel, defense industry representatives, and journalists and provides them with a common space in which to discuss emerging challenges in the field of international security and to take stock of the latest doctrinal and technological developments put forward by the defense sector and military planners. In the domain of military ground vehicles, the products displayed at this year’s exposition clearly reflected the ongoing process of transition within the U.S. Army’s armored force structure and provided contractors with a critical venue to showcase how their systems might come to define the future of the service’s armored force. After nearly 20 years of sustained combat operations against unconventional forces on the battlefields of Iraq and Afghanistan, emerging challenges to the existing structure of the international system posed by a rising China and increasingly assertive Russian Federation have compelled U.S. policymakers and military professionals to better prepare the Army, doctrinally and technologically, for conventional combat scenarios against a state enemy as outlined in the latest iteration of the National Defense Strategy while still maintaining the capacity to operate successfully in unconventional and counterinsurgency environments. This change in strategic priorities coincides with an armored force structure across the services that is increasingly seen as being reliant on capable, but nevertheless aging, platforms whose capacity to be effectively modernized is shrinking over time. 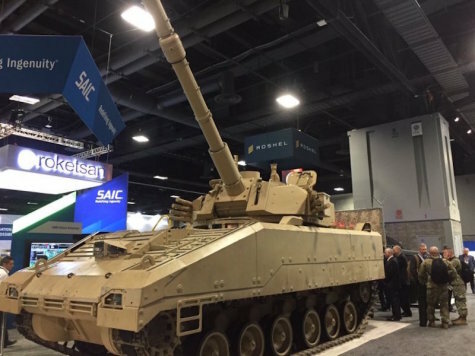 In response to these emerging technological and strategic demands, the Army has launched multiple new development and procurement programs, and industry competition over one of these, the Next-Generation Combat Vehicle (NGCV) program, became a prominent theme of this year’s exposition. The NGCV program encompasses a number of subordinate requirements, including the Armored Multi-Purpose Vehicle (AMPV), the Mobile Protected Firepower (MPF) vehicle, the Optionally Manned Fighting Vehicle (OMFV), and the next-generation main battle tank. OMFVs were positioned front and center on the show floor. The OMFV is slated to replace the M2 Bradley infantry fighting vehicle (IFV) and the MPF vehicle. It is intended to provide the Army with an airborne-capable light tank that can rapidly deploy an armored response to critical combat zones. The Army hopes to announce an award for prototype production of the NGCV by year’s end, with a final selection slated for 2022-2023. Four major contractors showcased their contenders for segments of the NGCV program on the show floor this year: General Dynamics Land Systems with its Griffin III demonstrator; Rheinmetall-Raytheon with the KF41 Lynx IFV; BAE Systems with the CV90 Mk IV model; and SAIC, ST Kinetics and CMI Defense offering a specially developed variant of the Next Generation Armored Fighting Vehicle (NGAFV) chassis. Making its public debut at AUSA 2018, the GDLS Griffin III demonstrator is a significantly altered development of the Griffin demonstrator platform displayed by GDLS at previous AUSA expositions, being adapted from the chassis of the GDLS Ajax platform developed for the British Army. The 40-ton platform is outfitted with a Northrop Grumman ATK 50mm auto-loading cannon with a notable elevation potential of plus 85°, intended to provide the vehicle with combat capacity in vertically challenging urban environments and engage aerial targets. The platform also integrates an IMI Systems Iron Fist active protection system (APS). The base model is designed to be operated by a crew of two and carry a squad of six infantrymen. The submission for the MPF program presented by SAIC, ST Kinetics and CMI Defense is adapted from the chassis of the ST-Kinetics Next Generation Armored Fighting Vehicle under development for the Army of Singapore. The platform integrates a CMI Defense Cockerill 3105 turret armed with a 105mm cannon. The 44-ton KF41 Lynx IFV is the latest iteration of Rheinmetall’s Lynx family of vehicles, and is being developed through a partnership with Raytheon. The KF41 is equipped with a Wotan 35mm cannon and mounted on a Lance 2.0 turret. The turret features two side-mounted pods to provide the platform’s operators with the capacity to equip it with anti-tank guided missiles (ATGMs) or other specialized technologies, and is intended to mount an active protection system. The Lynx has the capacity to carry up to nine infantrymen. Finally, BAE Systems displayed the latest model of the popular CV90 family, the Mk IV. This model, which is intended to meet the Army’s OMFV requirement, is equipped with a D-series turret outfitted in its display variant with a 30mm cannon, capacity for two ATGMs, and an Iron Fist APS. The vehicle has a carrying capacity of eight soldiers. Across all four platforms, great emphasis was placed on the technological growth potential, modularity, and operational flexibility of these respective platforms. Conscious of the highly unpredictable international environment, characterized by an eclectic array of conventional and unconventional threats, and the economic and budgetary considerations that come as a part of any procurement process, military vehicle contractors are increasingly focused on developing and selling systems that can be easily adapted to fulfill a broad spectrum of operational roles and allow for streamlined defense supply chains. Beyond the competition for the NGCV, the exposition also featured an array of new evolutionary designs and product announcements. In the evolutionary space, GDLS displayed its A1 30mm upgrade package intended to enhance the survivability and lethality of the Stryker platform through the integration of new optical systems and turreted 30mm cannon. AM General unveiled its NXT 360 light tactical vehicle, an up-armored variant of the venerable HMMWV and outfitted with a Remote Weapon Station (RWS). Oshkosh Defense introduced its latest FMTV tactical logistics vehicle, the A2, and BAE Systems introduced a new modernized variant of the M88 Hercules Armored Recovery Vehicle with enhanced lift capacity. Light armored vehicles have become a staple at AUSA over the past several exhibitions. Intended for dual use by military and law-enforcement personnel around the world, these comparatively low-cost vehicles often constitute a key component in the armored capabilities of states dealing with unconventional threats and domestic disturbances. Roshel Defense Solutions unveiled its new Senator 4×4 tactical vehicle on the show floor this year, with additional showings from Streit Group and International Armored Group. Finally, in the sphere of active protection, IMI Systems unveiled a new light decoupled variant of its widely used Iron Fist APS. As militaries around the world have been forced to confront the ever- increasing lethality of infantry-deployed anti-tank weapons systems over the past decade, active protection systems have started to become a requirement of most new armored vehicle development programs. However, both weight requirements and less robust armored protection have traditionally imposed limitations on the capacity of light vehicles to mount active protection systems. The new light decoupled version of the Iron Fist, presented at AUSA 2018 mounted on an Oshkosh Defense Joint Light Tactical Vehicle (JLTV), is intended to rectify this problem and likely signals a growing trend toward the emergence of light vehicle solutions in the APS market.